Mindika Moments: Monday Moments - Friends! A true friend is someone who allows you to stretch both inside and outside yourself, and loves every shape of you through the journey. I wrote this years ago for a college essay. I don't think I realized at that time in my life the full impact of that statement. The truth behind my random spark of enlightenment. The other day while waiting in the doctors office I read an article about woman and friendship. It talked about a woman's hard wire for female friendship. How woman instinctively seek out close female bonds to cope with life. It sighted an interesting study where they had women stand at the bottom of a steep hill. They asked the woman to gauge how difficult it would be to climb the hill. The woman who were standing by one of their female friends didn't gauge the hill as difficult as the woman who were standing alone or by a complete stranger. They also noted that the longer the woman had been friends the easier they gauged the hill to be. The article also sighted a study that shows woman with close female friendships cope with stress better, are generally happier and live longer! Sounds good to me...right? For some reason I found myself thinking a lot about friendship this weekend. Yesterday I was lucky to be sitting in church next to one of my best friends while we watched another best friend's first baby be blessed. These two women are an inspiration to me. We have stood by each other through many ups and downs over the years. Just knowing that I was going to see them yesterday, put a smile on my face all morning. As we were leaving for the baby blessing we were pulling out of our garage and my neighbor and dear friend was pulling up. She's been gone for the last couple weeks and I've missed her. I've missed talking to her and hanging out with the kids in our front yard together. When she saw me, she jumped out of her car and came to give me a hug before I pulled away. It made me smile! 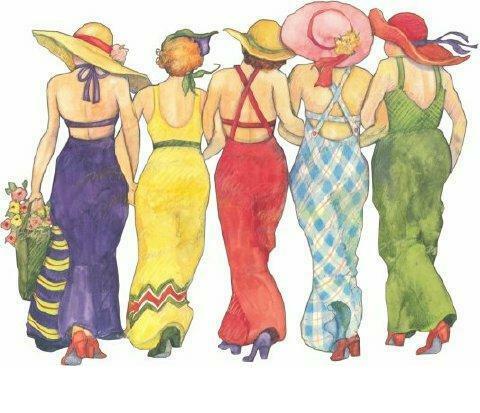 I am a lucky woman, because I have many many friends like that. Through out my life I have been blessed with good friends! Woman who I love. Woman who inspire, uplift, comfort, guide, support, teach, and share their lives with me. I have friends from high school that I still love and speak with often. I have college roommates and old mission companions that while months may go between contact, when we get on the phone it's like no time has passed. I have old work friends, and church friends and neighbor friends! There are friends I call when I need a shoulder to cry on, others I call when I need a good laugh, some I call when I need a spiritual up lift, the ones I call when I need a good vent session, and those unique and amazing friends I call for anything and everything! But no matter the case...they are always there for me. Words can not express the thoughts of my heart when it comes to my friends! To all of you, old and new...and you all know who you are...Thank You!! Thank you for loving every shape of me along the journey. I love you and couldn't live with out you! I just hope, in return, that I am and will continue to be the kind of friend you all deserve! Mindi, there are no words to describe you. You are a beautiful woman, a great friend and such a rock. I feel so grateful that our paths crossed at this time in our lives. You have taught me more than you know. Beautiful thoughts. Thanks for sharing!